Journal: I got up at about 5:45am to the sound of light rain which turned out to be fog. It had rained during the night. I decided to leave breakfast until I reached a town and was on the road by 6:45am. I made good speed, attacking the hills, on a road which basically followed a ridge which was gradually losing elevation. The only drawback was the loose gravel road which slowed the roll and made steering bends tricky. At about 8:30am I finally reached sealed road and the Warburton turn-off. It was then quite a fast descent to the Yarra Valley and then a flatter section through Reefton and McMahons Creek. I was hoping for a store for breakfast, but there wasn't anything until Warburton which I reached at 10:00am. By this time I was feeling quite tired. I stopped at a small supermarket in what I though was the main street and bought some cookies and juice for breakfast. I was disappointed to find around the next bend that there was a range of cafes where I could have dined. Too late! 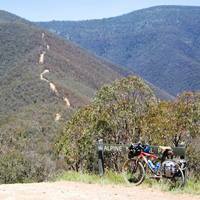 From Warburton, feeling quite tired and dealing with a strong headwind I found the Warburton Rail Trail and set off for Mt Evelyn. Despite the wind, it was a pleasant and scenic trail and I made quite reasonable speed. At Mt Evelyn I stopped for a big lunch in a bakery and then headed for Melbourne on main roads. I called the in-laws to see if they would be around for afternoon tea and arrived there at 3:30pm having dealt with the busy traffic. It was nice to get there and be greeted by Kath, Geoff and Robyn, but it didn't have the same degree of relief as finishing the Appalachian Trail. From there I rode to Glen Iris arriving about 5:00pm to be greeted by Dad. I felt a sense of accomplishment, especially having dealt with the challenges of the Tom Groggin and Billy Goat Bluff Tracks, which I think were as physically demanding as anything I have done. The trip met my expectations re small towns, bush country and adventures (snow, etc.). I was pleased I had done it and was thinking what next.